On Wednesday, the 15th China-ASEAN Expo opened in the south China city of Nanning, putting fresh impetus into regional trade at a time when the anti-globalization sentiment in many parts of the world has imposed threats to regional economic integration. Beerlao may not be a household name in China when it comes to alcoholic drinks, but over just a few years, the beer brand from Laos has gained a strong following for its distinct flavor. "China has become the largest overseas market for Lao Brewery Company, accounting for about 70 percent of the market share," said Phengrattanavong Khomsone, manager of the brewery which produces Beerlao using hand picked indigenous rice varieties and spring water originating from the foothills of the Himalayas. The beer's rise from obscurity to popularity in China started in 2012, when it entered the Chinese market after being showcased at that year's China-ASEAN Expo, a major platform where trade deals are signed between China and member states of the regional bloc -- the Association of Southeast Asian Nations (ASEAN). 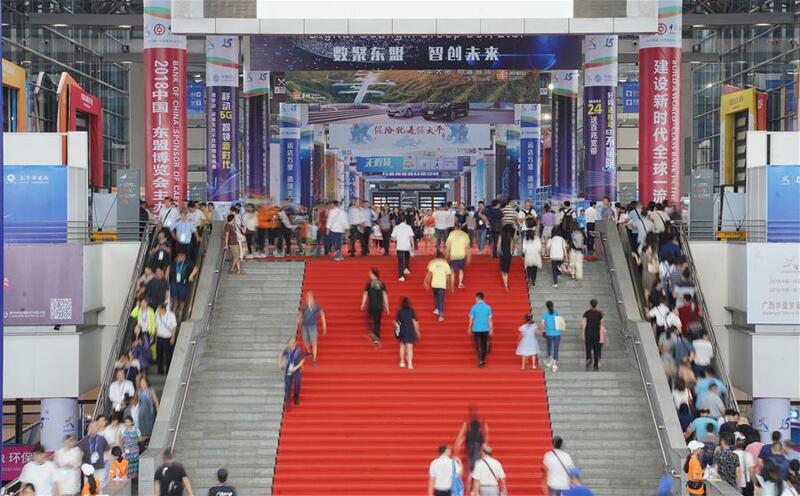 On Wednesday, the 15th edition of the annual event opened in the south China city of Nanning, putting fresh impetus into regional trade at a time when the anti-globalization sentiment in many parts of the world has imposed threats to regional economic integration. Over the past 14 years, the expo has boosted China-ASEAN trade. China has expanded its exports of electronic products, construction materials, power equipment, construction machines, as well as technology in new energy, high-speed trains, and agriculture, to ASEAN member states. The bloc's food, daily goods, and bulk commodities are favored by Chinese buyers. At this year's expo, officials, executives, and businesspeople from China and Southeast Asia voiced their steadfast commitment to safeguarding the multilateral trade regime as well as opposition to unilateral protectionist measures taken by some countries. "Relations between China and ASEAN have stood the test of time and become the most successful and dynamic example of Asia-Pacific regional cooperation," Chinese Vice Premier Han Zheng said at the opening ceremony of the expo. China has been the largest trading partner of ASEAN for nine consecutive years and ASEAN has been the third largest trade partner of China for seven consecutive years, according to Han. Han said China is willing to make full use of platforms such as the upcoming China International Import Expo and China-ASEAN Expo to expand imports from ASEAN member states and encourage bilateral investment. "China is willing to promote the implementation of the upgraded China-ASEAN FTA and accelerate the negotiation of the Regional Comprehensive Economic Partnership (RCEP) on the basis of mutual benefit and win-win outcomes," Han said. Han's proposal to promote trade and investment was echoed by senior officials from the ASEAN member states. "Due to protectionist policies of some countries, the world economy is facing pressing challenges and trade frictions have arisen," said Lao Deputy Prime Minister Somdy Duangdy. "It is time we made efforts to maximize the benefits of the China-ASEAN FTA, by lowering or abolishing tariffs, and strengthening cooperation, in a bid to create new opportunities for trade and investment between the two sides," said Somdy. "Cooperation between China and ASEAN continues to prosper despite the uncertainties, challenges, and risks in the global economy," said Vietnam's Deputy Prime Minister Vuong Dinh Hue. "Such cooperation is not only mutually beneficial, it is also the highlight and positive driving force of the growth of global economy, trade, and investment," he said. Themed "Jointly Building the 21st Century Maritime Silk Road, Forging the China-ASEAN Community of Innovation," this year's expo features a host of exhibitions, forums, and exchange programs, aiming to lift friendly cooperation between China and ASEAN to a new level. Chinese and foreign exhibitors have shown enthusiasm for the four-day event. More than 2,700 firms, including a number of Fortune 500 companies, have showcased their products at the event, up 2.6 percent from the previous event. Innovation is a highlight of this year's expo. China and ASEAN countries are displaying their latest progress in upgrading the manufacturing sector and better integrating industrial and value chains. "Technology and innovation have become an important boost for accelerating regional integration, promoting people-to-people exchanges and raising working efficiency in various sectors," said Cambodian Prime Minister Samdech Techo Hun Sen. Besides innovation, connectivity will also play an important role in facilitating trade. Every week, three freight trains run from southwest China's Chongqing Municipality to Guangxi Zhuang Autonomous Region in the south, carrying cars, car parts, and electronics, among other goods. From Qinzhou, on the coast of Guangxi, the containers are further shipped to Singapore and other ports in Southeast Asia. Since it opened last September, the route has been an encouraging success. To most destinations, the new route is about two weeks faster than the traditional route through Shanghai. The new sea-rail transit route is part of China's efforts to build the 21st Century Maritime Silk Road, a key component of the Belt and Road Initiative. Southeast Asian countries have welcomed China's contribution towards furthering ASEAN connectivity and integration through the various transport and other infrastructure projects. Somdy hailed China's Belt and Road Initiative, especially infrastructural projects under its framework, as a boost for regional connectivity and trade relations between China and Southeast Asian countries. "I hope ASEAN and China can continue cooperation under the guideline of the Belt and Road Initiative and the Master Plan on ASEAN Connectivity 2025, to achieve connectivity and facilitate trade and investment," Somdy said.